Eminem fans were shocked when the rapper teased his involvement with Sony's upcoming Venom movie last month. Eminem then one upped all speculation and released a surprise full-length record the very next day, which contains the track "Venom," named after the highly anticipated movie. And now, we have a brand-new TV spot for the film, which features the title track and gives the movie a whole new vibe that is much different from the promotional material that we've seen released in the last handful of months. Eminem's new album Kamikaze lets the rapper take aim at some specific individuals including Die Antwoord, Charlamagne tha God, Machine Gun Kelly, and a bunch more. The Venom TV spot has Tom Hardy's Eddie Brock getting some troubles off of his chest as well, but not in such a vulgar way with words. But, when the symbiote takes over, there's no telling what can happen. The symbiote could have some beef with some mumble rappers and might have trouble pronouncing Die Antwoord too, just like Em. 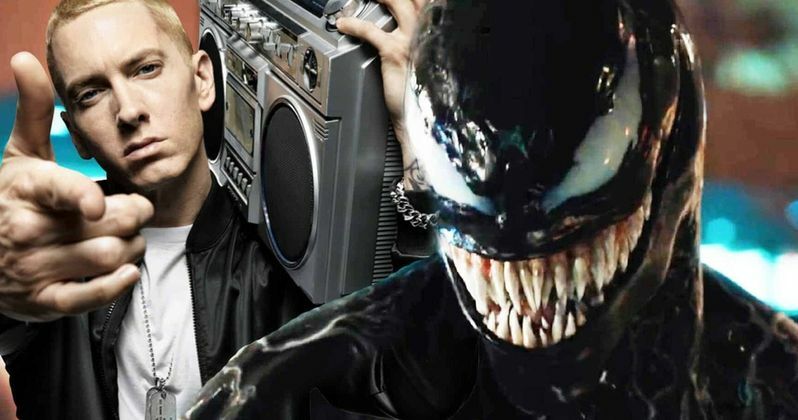 So far, Eminem is the only artist confirmed for the Venom movie soundtrack. However, that's a pretty strong start, especially considering that the song came off of a record that that was produced in secret and given out as surprise to fans. Run the Jewels seems like an easy choice to throw into the mix, but they already had a song in the early promos for Black Panther, even though their music didn't make it on the Kendrick Lamar-curated soundtrack. Lamar pretty much knocked it out of the park with his soundtrack work, so Venom will have a lot to live up to in that department. As previously predicted, Venom will be a PG-13 affair and will fall just under the 2-hour mark when it hits theaters next month. The rating will come as a disappointment for some who were hoping that Tom Hardy would be leading an R-rated affair. It's been rumored that Sony was leaning towards the kid-friendly rating for months, which could leave the possibility of a Spider-Man crossover down the line. However, Venom remains outside of the Marvel Cinematic Universe for the time being, and it's unknown if Peter Parker will meet up with Eddie Brock. Venom hits theaters on October 5th, which is only a few short weeks away. While the PG-13 rating ensures that younger audiences will get a chance to see the film, many are under the impression that it won't be dark enough. With that being said, Marvel fans were turned off when the first teaser trailer was released and have started to come around with the release of each new piece of promotional material. Now, Eminem is on board to promote the movie as well, which could help get some people into theaters as well. While we wait to find out, you can watch the TV spot featuring Eminem below, thanks to the Venom Movie News Twitter account.